SmartATI Construction is proud to have been named the 2016 2nd Fastest-Growing Women-Led Business in NH this year! 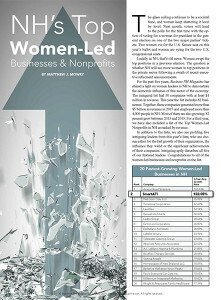 Business NH Magazine has shined a light on women leaders in NH for the past five years to demonstrate the economic influence of this sector of the economy. SmartATI Construction not only ranked the #2 spot on the list, but also boasts a three-year average growth rate of 122 percent! We are proud of our advances and growth as a company this year, and contribute the success to our company’s strong leadership and work ethics which continue to propel SmartATI to the top!